"All things considered Yogi's not that much smarter than the average bear." Yogi debuted in 1958 as a supporting character on The Huckleberry Hound Show. He became very popular, and in 1961 was given his own show, which also included the segments Snagglepuss and Yakky Doodle. There was even a musical animated feature film, Hey There, It's Yogi Bear!, in 1964. Over the years he appeared in many other spin-off series as well, including Yogi's Gang (1973), Yogi's Space Race (1978), Galaxy Goof-Ups (1978), Yogi's Treasure Hunt (1985), The New Yogi Bear Show (1988) and Yo Yogi (1991). Like many Hanna-Barbera characters, Yogi's personality and mannerisms were based on a popular celebrity of the time. Art Carney's character on The Honeymooners was said to be Yogi's inspiration. Yogi's name is a nod to the famed baseball star Yogi Berra. The plot of most of Yogi's cartoons centered around his antics in the fictional Jellystone Park, a takeoff on the famous Yellowstone National Park. (There had been a 1941 Bugs Bunny cartoon, Rabbit Trouble, that used the more obvious name "Jellostone" Park, a play on both the national park and the popular gelatin dessert. 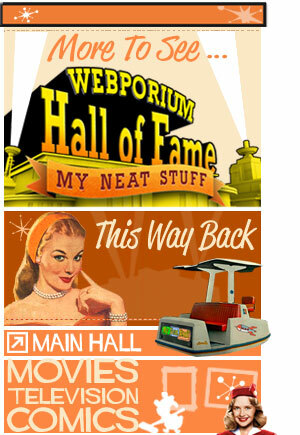 Presumably, Hanna-Barbera wanted to avoid any issues with using a trademarked name, even in a satirical way.) 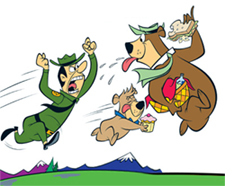 Yogi, accompanied by his reluctant best friend Boo-Boo, would often try to steal picnic baskets from campers in the park, much to the chagrin of Park Ranger Smith. Stretching literary license significantly, the relationship of Yogi and Boo-Boo could be compared to that of Don Quixote and Sancho Panza, in the context of the whimsical, adventurous leader and the practical sidekick. 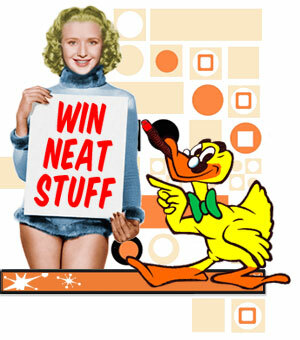 Hanna and Barbera would repeat this formula many times, notably in the later series Quick Draw McGraw. 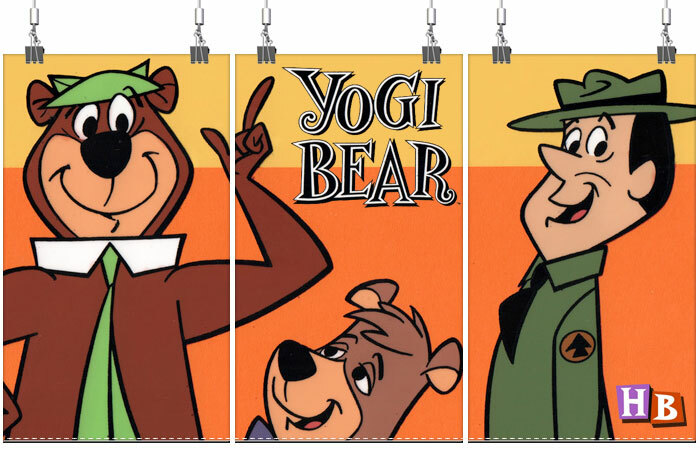 Yogi Bear is well-known for a variety of different catchphrases, including his pet name for picnic baskets ("pic-a-nic baskets") and his favorite self-promotion ("I'm smarter than the average bear! "), although he often overestimates his own cleverness. A spoof of Yogi Bear appeared in The Simpsons episode, "When You Dish Upon a Star" where Homer dreams that he is Yogi. Yogi and Boo Boo also appeared on Adult Swim's Harvey Birdman, Attorney at Law in 2002 in the episode "Death By Chocolate", where Boo Boo was accused of being a Unabomber-like character. 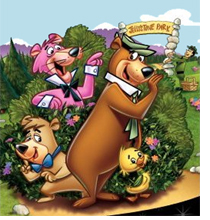 In addition, Yogi Bear lends his name to a chain of recreational vehicle and camping parks, "Yogi Bear's Jellystone Park Camp-Resorts", with the first opening in 1969 in Sturgeon Bay, Wisconsin, and as of 2006, had over 70 locations in the United States and Canada. There is also one remaining restaurant from the chain bearing Yogi's name, "Yogi Bear's Honey Fried Chicken", in Hartsville, South Carolina. In both cases, Hanna-Barbera licensed the name and likenesses to the respective companies. Yogi Bear is a 2010 American live-action film adaptation of the Hanna-Barbera cartoon series The Yogi Bear Show directed by Eric Brevig. The film stars Dan Aykroyd, Justin Timberlake, Tom Cavanagh, Anna Faris, T. J. Miller, Nate Corddry, and Andrew Daly. The film was originally slated for release on June 25, 2010, but was pushed back to December 17, 2010. It was distributed by Warner Bros. with Hanna-Barbera serving as a co-producer. It is the first film development of a Hanna-Barbera property produced without the assistance of William Hanna and Joseph Barbera, who died in 2001 and 2006 respectively. 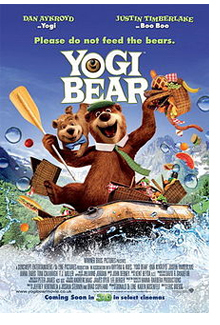 The film tells the story of Yogi Bear as he tries to save his park from being logged. 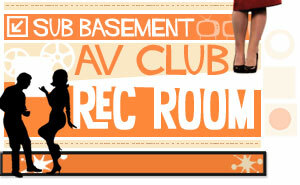 Principal photography began in November 2009. It was preceded by the 3D short Rabid Rider, starring Wile E. Coyote and Road Runner. 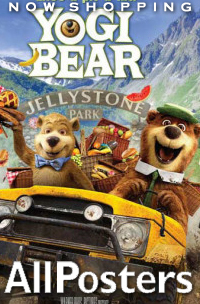 Yogi (voiced by Dan Aykroyd) and Boo Boo (voiced by Justin Timberlake) are two brown bears who have a penchant for stealing picnic baskets from visitors to Jellystone Park, while park rangers Smith (Tom Cavanaugh) and Jones (T. J. Miller) try to prevent them from doing so. Meanwhile, Mayor Brown (Andrew Daly) realizes that his city is facing a financial crisis due to profligate spending on his part. To solve it and fund his election campaign to be the next state governor, the mayor decides to "find some place losing money so he can earn it", and he picks Jellystone, the park where the bears live. The park is selected as a logging site, and Jellystone is shut down. Now seeing that their home is in danger of being destroyed, it's up to Yogi and Boo Boo, along with Ranger Smith and a documentary-shooter named Rachel (Anna Faris), to save the park. Like many Hanna-Barbera characters, in the original cartoon, Yogi's personality and mannerisms were based on a popular celebrity of the time. Art Carney's Ed Norton character on The Honeymooners was said to be Yogi's inspiration; his voice mannerisms broadly mimic Carney as Norton. Norton, in turn, received influence from Borscht Belt and comedians of vaudeville. Dan Aykroyd, the voice actor of Yogi Bear, stated that he is trying to evoke the influences that shaped the original Yogi Bear's voice. Aykroyd said, "It's about hitting certain notes, going back to those old Lower East Side rhythms, the Catskills, Jersey, Upstate New York. It's the Yiddish language, essentially, being spoken in English. 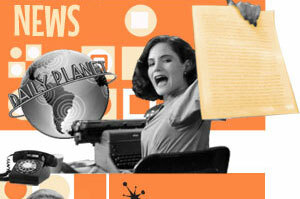 It's the 'setup, delivery, punch' that sitcoms live on today. That's where the origin of American humor is." Aykroyd has stated that he grew up watching Yogi Bear on the long, cold, dark afternoons in his native Ottawa: "As a kid growing up in Ottawa, Canada, where the sky turns dark in the winter at about 3:30, Yogi bear was my fire, my hearth, when I would come home. 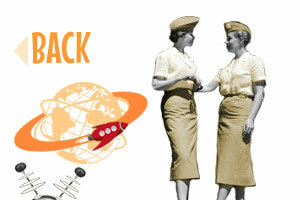 I would immediately turn on the TV while I thawed out." Justin Timberlake came in with a prepared Boo-Boo voice; when he was learning to sing when he was younger, he imitated various cartoon characters. Eric Brevig said that he intended to make a film that did not want parents who remembered watching Yogi Bear cartoons to feel marginalized and displaced by the contemporary rendition of Yogi Bear.